Think of this recipe as the result of the fact that a) I love carbs and b) because of my carb love, I couldn’t decide between pumpkin pie and dinner rolls. So I combined them. Genius/crazy/this is my brain on Thanksgiving? It’s probably all of the above. Thanksgiving has looked a little different for us every year for the last five or so years. While growing up it was always at my parents’ house, since Elliott and I got hitched it’s also been in our tiny apartment in Iowa, at his parents’ place and this year, we are hosting again. Except on Saturday, instead of Thursday (because the husband has to work on the holiday, boo). Another new tradition that’s popped up somewhat unplanned-ly is the fact that I always end up making the dinner rolls and at least one of the desserts. It’s not like we even decided, “Hey Steph, these are the things you make.” It just happened that way — which means those are just the things I tend to make for funsies. Someone else can be in the charge of the turkey; I’m very good at eating that, though. 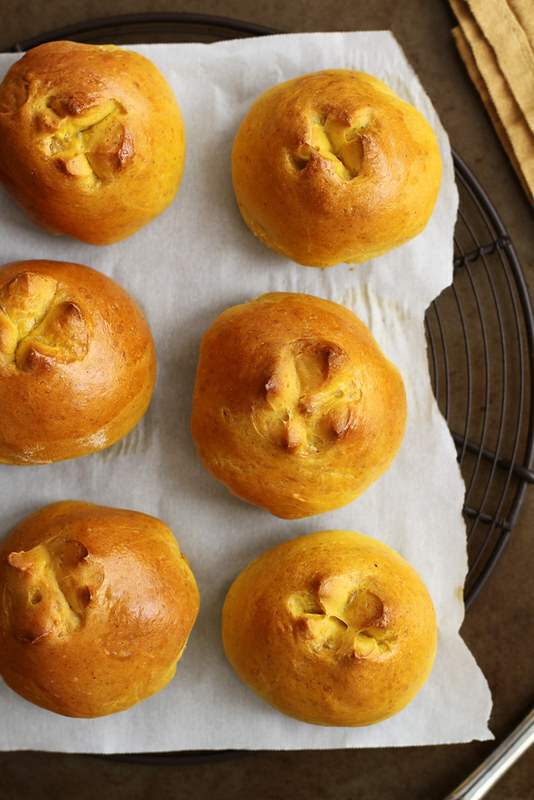 This year, these pumpkin pie brioche rolls will obviously be gracing the Thanksgiving dinner table as the dinner roll portion of the evening’s eating festivities. If they can make it that long. I’ve already polished off three of them for testing purposes, ahem. Brioche continues to be one of my favorite types of breads to bake because the dough is so soft and the results are SO FLUFFY. And there are not many better things than a warm, fluffy roll with melty butter on top. In this case, I highly suggest maple butter. Trust. Nope. I did. And I’m doing it again right now. If there is any reason to break with Thanksgiving tradition, it’s these rolls. You will not regret it. And yes, this does mean you can still have pumpkin pie for dessert, OBVI. In a large bowl or bowl of a stand mixer, combine 1 3/4 cups flour, sugar, salt, cinnamon, ginger, cloves, nutmeg and yeast. Add pumpkin, warm water, butter and eggs. Stir, adding just enough of remaining 1 1/2 cups flour until a dough forms that pulls away from sides of bowl. On a lightly floured surface, knead dough by hand 10 minutes until smooth, soft, elastic and only slightly sticky; OR, knead dough with dough hook attachment in stand mixer on medium speed 5 minutes until smooth, soft, elastic and only slightly sticky. Shape dough into a ball, then place in a large lightly greased bowl; turn to coat. Cover bowl with plastic wrap and let rise in a warm place 1 hour until doubled. Heat oven to 375 degrees. Line a baking sheet with parchment paper. Punch down risen dough, then divide into 12 equal pieces. Roll each piece into a ball, then place on prepared baking sheet spaced at least 2 inches apart. Cover with a tea towel or lightly greased plastic wrap and let rise 30 minutes until doubled. Just before baking, use scissors or a sharp serrated knife to score tops of rolls about 1/4-inch deep. Brush tops and sides of rolls with egg wash. Bake 20 to 25 minutes until golden brown. P.P.S. And in case you need more Thanksgiving carb/dinner roll ideas, here are a few more! I heart your genius/crazy/carb-loving brain! No matter what day you celebrate, it’s going to be wonderful. Good for you for hosting too! Thank goodness for your love of carbs girl! These rolls are lovely! These need to be on my table like tomorrow. I am pretty sure I should not wait until Thanksgiving. They look too good! Haha I made these last night with your 45 Minute Coq Au Vin! These rolls look perfect Stephanie! OMG these look amazing and I love brioche bread. I must add a Kitchenaid mixer to my registry stat! I want these on my Thanksgiving table too! These rolls look absolutely perfect. Pinned! Wow! Delish! I totally want to break Thanksgiving traditions for these. I better they’re awesome smothered with apple butter too. Brioche is hands down my favorite type of bread. 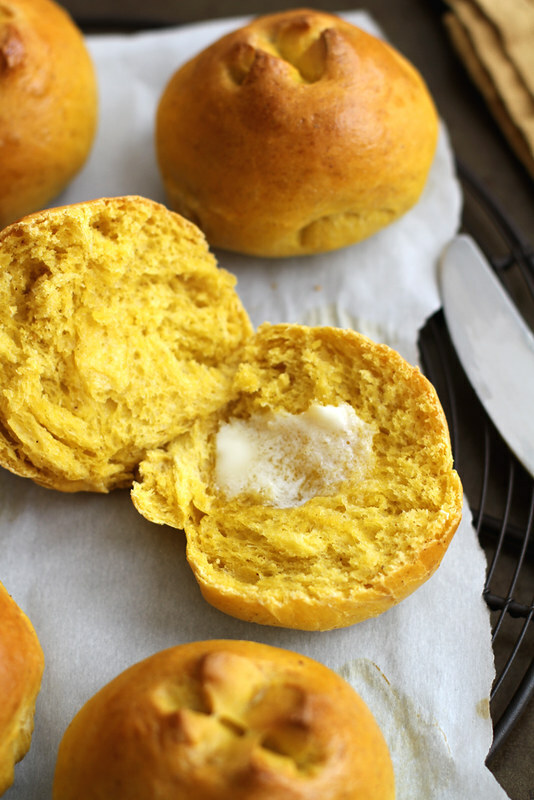 It is so perfect in every way, and then you threw pumpkin in the mix and made these dreamy rolls! Pinned! Ok, tried these today. Despite my yeast being bad, they were amazing. Quick question: when should I use bread flour instead of all-purpose? This would be SO PERFECT on any T-Giving table! I would make a million tiny sandwiches and just eat them. Wow, what beautiful brioche rolls! I can allllmost smell them through my laptop screen 🙂 I feel the same way about the turkey…let someone else take care of that, I’ll take care of the carbs! rolls are my favorite part of the meal. These look amazing! Those look amazing! 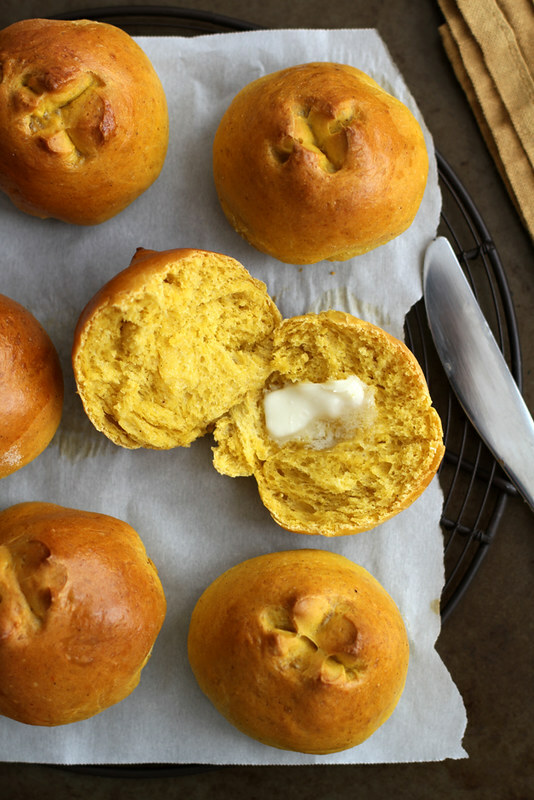 I love making bread too, and these pumpkin pie brioche rolls will definitely be made here soon! They look so soft and fluffy! very thankful for your love of carbs and delicious, delicious pumpkin brioche rolls. I have to try these!! Pumpkin pie in my Thanksgiving rolls?? Sign me up, sister! I love holiday traditions and baking fantastic rolls for company is definitely one to keep! Can I come to your Thanksgiving?? Pumpkin + brioche?! Yes please, these rolls look dreamy! These look so amazing! I want to try them out. Yuuuuuum that picture with the melting butter is killing me. The things I would do to have one of these for breakfast! They look amazing. Pinned! I love brioche. I think this is more genius than crazy! oh my gawd, these rolls!!! These have to happen soon in my kitchen. . love!! These are just absolutely perfect for Thanksgiving! Love the combination of pumpkin pie flavors with brioche rolls! Pumpkin Pie Brioche Rolls! Little Goat Bakery in Chicago is making them too – but now I know how to make them at home. Thanks! These look so good! I’m so used to having pumpkin in sweet stuff though – would you say these are more on the savory side? Carolyn — I wouldn’t say they are savory, but the sweetness is very mild! I love to cook. And that is what I usually do. Other than a classic quick bread, I have never made any sort of dough. These were fantastic! The key was to give them their time to rise and shine. I paired these with a quick coq au vin from half baked harvest and later this week they are going to be paired with my thai butternut squash bisque. SO yummy! Thanks for making it so easy! These look awesome. I’m planning to make these for Thanksgiving at my mom’s house. We probably won’t sit down to dinner for a couple hours after we arrive. Any suggestions as to what can be “made ahead” and what I should do at Mom’s to ensure these rolls stay fresh and soft? I’m not too familiar with breads and whether the dough is ok to “sit” for longer than prescribed in the recipe. Meghan — You can make these the day before and leave them out at room temperature overnight (covered, in a plastic zip-top bag, ideally). The next day, you can heat them up on a baking sheet in the oven at 300 degrees until warmed through. Hope that helps! Thanks Stephanie! If I were to prep them the day of, would I do the same thing–bake them completely, bring them in a ziploc and then just warm them up when ready to eat? Thanks and sorry for all the questions! Meghan — Yep, that’s exactly what you’d do! Seriously, made them yesterday for the big day, and none of them made it to today; everyone loved them, and your recipe was very easy to follow! They were light and fluffy and filled with amazing pumpkin flavor. O — Yay! I’m so glad you made them and that everyone enjoyed them. 🙂 Thanks for sharing! Lindy — Yes, but it might rise more quickly so keep an eye on when the dough doubles in size! I’ve been looking for a brioche roll recipe and I think this is it. The roll is sturdy enough to withstand being the buns to a burger slider or a pulled pork sandwich with coleslaw, yet soft and fluffy enough to eat alone with homemade peach jam. Ask me how I know. For this Thanksgiving, I just may replace my beloved potato rolls with these pumpkin pie ones.